Birthday Cake Peanut Spread (Dry Roasted Peanuts, Protein Blend [Hormone-Free Whey Protein, Natural Flavor, Less than 0.1% Lecithin & Stevia], Organic Cane Sugar, Natural Flavors [Sunflower Oil], White Chocolate [Cane Sugar, Cocoa Butter, Whole Milk Powder, Vanilla, Less Than 0.1% Soy Lecithin]), Hormone-Free Whey Protein, Cane Sugar, Palm Oil* (Sustainably Sourced), Natural Flavors (Sunflower Oil), Gluten Free Oat Flour, Natural Sprinkles (Cane Sugar, Corn Starch, Palm Oil, Sunflower Lecithin, Natural Flavors, Natural Colors, Carnauba Wax), Whole Eggs, Salt, Baking Soda. Whey Protein, Peanut Butter, RSPO Palm Oil, Cane Sugar, GF Oat Flour, Natural Flavors, Dutch Cocoa Powder, Eggs, Salt, Baking Soda. Whey Protein, Almond Butter, RSPO Palm Oil, Cane Sugar, GF Oat Flour, Natural Flavors, Cinnamon, Eggs, Salt, Baking Soda. 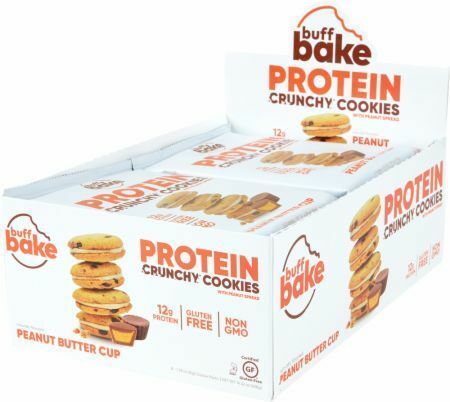 Whey Protein, Peanut Butter, RSPO Palm Oil, Cane Sugar, GF Oat Flour, Natural Flavors, Eggs, Salt, Baking Soda. Because who doesn't love a good old-fashioned sandwich cookie?! Now you can treat yourself without the added guilt. Buff Bake's Protein Sandwich cookies are the new and exciting way to get some extra protein in your diet! Enjoy a rich and creamy filling sandwiched between two crispy protein cookies! With NO artificial preservatives, sweeteners or flavorings, this sweet treat will satisfy both the inner child and the responsible adult inside of you!